Do you have an upcoming party or get-together that you need to make an appetizer for? Actually…it doesn’t have to be soon…do you EVER take an appetizer to parties? Actually…it doesn’t have to be a party…do you want to eat delicious food?! This dip is ridiculously good, y’all. No joke. I could seriously just camp out with a whole box of crackers and the entire bowl of this dip, and go to town. I might be a fatty covered in cracker crumbs and little pieces of spinach in my teeth, but I’d be one happy gal. I didn’t do that, though (at least…not with the WHOLE bowl of dip). 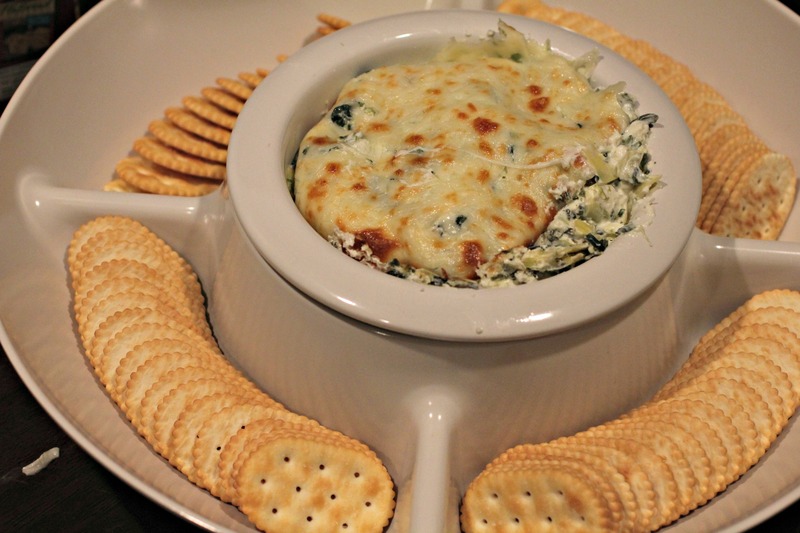 I made this dip for my in-laws at dinner last week, and it was a big hit. There is probably no one who wouldn’t like this dip. 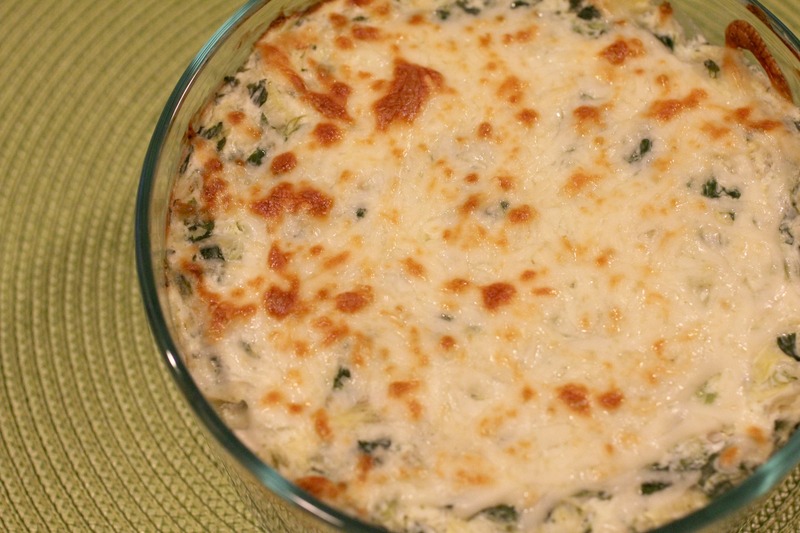 Even people who are not big spinach/artichoke fans will probably still like it because of all the gooey cheese and salty crackers! The veggies really give it more texture than flavor. I also liked that this dip only took 30 minutes total to prepare and cook. It was super convenient since I only had about that much time between getting home from work and heading over to our little dinner party. By the way, I gotta give a shout-out to my parents for giving me this awesome chip/dip platter. The dip part in the center has a warming bowl that you plug in underneath it so it keeps your dip warm and melty. Genius! Thanks Mom and Dad! Bake until the sides are bubbling and the cheese has melted and turned golden brown on top, about 20-30 minutes. Serve warm with Townhouse Crackers or Pita Chips. Thanks Bonnie! It was delish! I can’t wait to make this next week!!! I love your new picture!! Thanks Judy! I love all the cheese too 😀 Thanks for letting me know about the WP follow button Hopefully it was just a fluke! 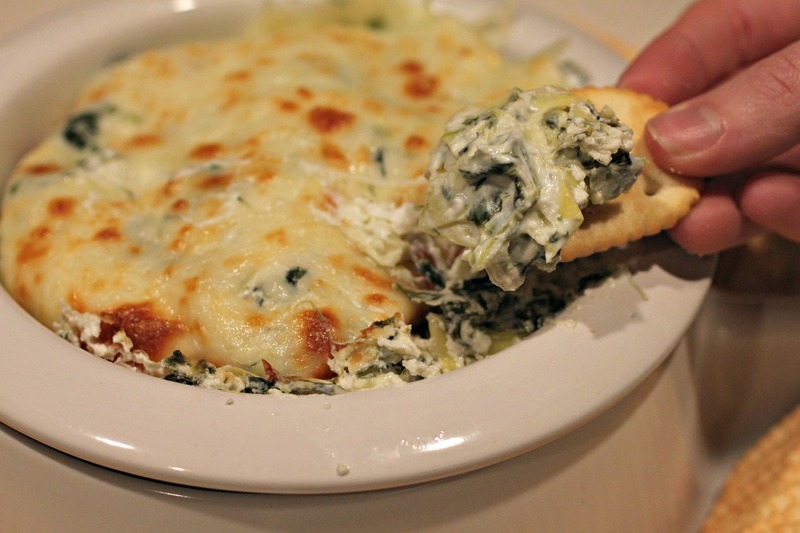 Hi Lindsay – I just found this post – I love Spinach and Artichoke Dip!! Tonight I’m posting about a few of my favorite bloggers & featuring one of their appetizer recipes – and I’m including you & this amazing recipe! The other bloggers I’ve chosen are “From the Bartoloni Kitchens” and “Diane’s Kitchen Table. I’m including a photo and the link for each of the bloggers I’ve chosen – not that you seem to need anymore publicity. You’ve done sooo well in such a short time. Good for you Lindsay !! Wow thank you so much Cecile! For including me and this link in your blog post, and for your sweet words about my own blog! You are too kind! Can’t wait to check out the other recipes you post! War Eagle, Kelly!! Glad this was a hit at your party! It’s definitely one of my favorite party recipes.